The AME 4100ROT Later Rotation Mattress System is designed with both 8 & 10" transverse air cells configured to provide lateral rotation on an anatomical pressure relieving surface. 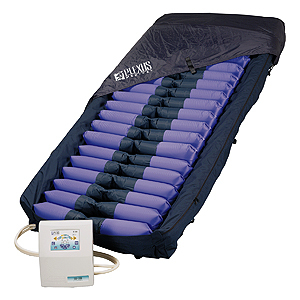 Side air cushions stabilize larger patients during the rotation cycle while providing additional protection at the side rails. All air cushions are constructed of high quality and very pliable coated nylon for low shear and even lower interface pressures. AME 4100ROT Quilted Top Sheet is highly vapor permeable and over-sized providing a low friction, low shear barrier against complications due to moisture. Machine washable. Unique modular design facilitates interchangeability, cleaning and setup. Convoluted foam base provides additional safety to your patient. The therapeutic support surface is lightweight and made of high quality materials. It conveniently rolls up for easy carrying with attached straps. Separate carrying case also available. 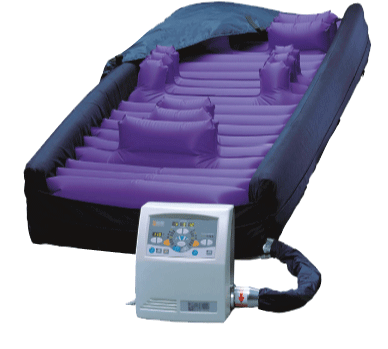 Lateral rotation therapy mattress system. Adjustable rotation angles, and hold/dwell times. Outer air bolsters help to stabilize patients during the rotation cycle while providing additional protection from entrapment and patient falls. Quiet and lightweight control unit. Nylon-coated, 8” high air cells provide full immersion and envelope the patient. Water proof, breathable high quality nylon top cover reduces friction and shear. Microprocessor controlled for simplicity, reliability, and ease of use. Rotation angles and cycle hold times are selectable for customized therapy. Keypad may be locked out to prevent interruption of therapy. Automatic transport mode maintains inflation during power outages. Alarms for power or mattress pressure failure. CPR quick release provides for rapid deflation. Control Unit is extremely compact and lightweight. Also available in 220V model. Size Control Unit: 5'' x 10'' x 12'' / 12.7cm x 25.4cm x 30.5cm. Mattress: 10'' x 34'' x 80'' / 25.4cm x 86.3cm x 203.2cm. Weight Control Unit: 5'' x 10'' x 12'' / 12.7cm x 25.4cm x 30.5cm. Warranty Control Unit: 2 year Ltd.